A few weeks ago we decided to start looking into traveling with the Fantastic Four over Jim and Evan's Spring Break. We eventually settled on traveling to the Chicago area, picking up Jim's friend Everett and continuing on to Kentucky to meet/visit Everett's family. Did I mention that we'd be traveling with four kids??? As the Mommy, it falls to me to plan the logistics of getting everything that everyone could possibly need from point A to point B and then on to point C and back again. I have spent no small amount of time in considering all of this! And to make things more interesting? We're doing the road trip the old fashioned way. No TV/VCR/DVD/MP3 players/I-pods or video games. How much Benedryl does it take to put kids to sleep but not kill them??? I think I have a couple of tricks up my sleeve that I'd like to run past other seasoned traveling families. First off, as I find good trip snacks and little toys I'm putting them in a bag on top of the fridge. I'm planning on packing one small gift bag per child of things to do in the car. These bags include stickers, books, small cars, and other non-noisy toys! I'll also keep a few things in a separate bag to pull out fresh for the long trip home. When we were in Sioux Falls last weekend the Aunties hit the goodie bag section of Wal-Mart's party supply aisle and loaded the kids up. I confiscated those toys pretty quickly and they're in the bag on top of the fridge! Shhhh, they don't need to know they're getting the same gift twice! The second thing I'm hoping is a stroke of genius and not a bout of stupidity involves clothes for all four. My intention is to lay out clothes for everyone and pack them all together by days in one separate plastic bag per day. So, the kids will all share one suitcase which will contain seven different Wal-Mart type bags. All of the clothes for Monday will be in one bag, Tuesday in another etc. Then when it comes time to dress the kids we pull out that day's bag and everything we'll need for that day will be right there handy. There will also be one extra bag which will have a complete outfit per child in it. So there you have it. Our traveling plans. Seasoned road trippers, what do you think??? I have a minute or two to spare and thought I'd jot down a quick note for the two of you who have mocked me for not blogging. I loaded up the four young'uns last Thursday and drove them over two hundred miles to my sister's house in South Dakota. They were thrilled. And they were fantastic! We saw the Butterfly House, we played arcade games at a pizza joint, we hit the junk shops and we spent time with the relatives. Believe it or not, it was a fabulous time! I have traveled alone with the kids (does that even make sense?) several times and I always come away with a new appreciation for single parents. So if you're reading this and you're a single parent you get a big ol' round of applause from me. Good Job!!! Stay at home mom is a tough gig, but single parenting is an even tougher one. Hello everyone! I just found the ultimate in cute just this morning, and since it's now Works For Me Wednesday I can share it! Okay, back to the kitchen cute. My pastor's wife's sister *Rebecca* actually posted about this at *her blog* today, so please go to her blog and read the entire post. Thank you. Finding a cute, cheap, creative idea REALLY works for me! Just a quick couple of pictures for you. First off, Avery turned two on the 23rd of February. 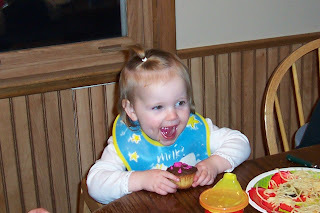 We had some cupcakes for her birthday instead of making a big real cake. And another milestone happened just this morning. Aidan loves making frozen waffles for breakfast for himself and the younger sibs. He asked me this morning if I'd purchased any during grocery day yesterday. I told him that I hadn't, but that I would next time I was at the store if he'd write it on the list. "But Mom, I can't spell waffle." I told him to draw a picture instead. 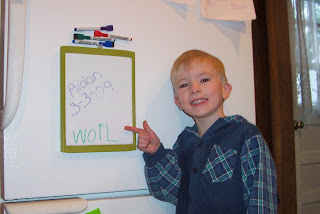 He got all excited about drawing all the little squares and came up with this: "WOFL". Waffle. :) We have phonetic awareness! Now if you'll excuse me, I have to run to the store. We're out of wofls.